One of the brothers describes his journey. Children lit a small candle for each intercession and slowly the crypt of the Franciscan monastery at Telfs lit up. We had gathered there for an evening prayer. The Tyrol was the last stage of a six day journey across the various Bundesländer (federal states) of Austria. This gesture of the children was a beautiful sign of hope! Even though we can be discouraged from time to time, a little light shines in the darkness, and children remind us that life is transmitted from generation to generation. Many people had come on that day. In the afternoon, a meeting with some young people for a bible sharing; later, other people joined us: young people, children, adults, even some from across the border in Italy. Some nuns were also happy to be there: they had heard Taizé spoken of here and there. Others told of their numerous stays at Taizé and how important these experiences were in their daily life. All were warmly welcomed by the Franciscans. 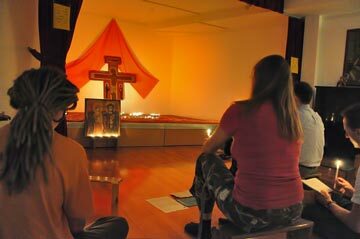 A prayer with the songs of Taizé has been held regularly, in their monastery, for a number of years. A small group of instrumentalists accompanied us and, after the prayer, we stayed together a long time to talk. A real moment of encouragement. Each person wanted to take away, from this evening, a light to be carried in their everyday life towards those entrusted to them. The journey had begun six days earlier in the Austrian capital. At a parish in the city centre, a group of young people were preparing to travel to Taizé. None of them had been before and they wanted to prepare together on this evening. We watched the new film ‘Life at Taizé’ together, we spoke about practical questions concerning the meetings for young people, and in the evening we prayed in an oratory at the Parish Youth Centre. There was joy in the air at the thought of seeing each other again soon at Taizé! 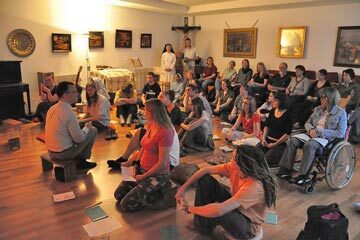 The following day an ecumenical group of young people from Vienna had invited us to an ‘afternoon of prayer and reflection’. The meeting was held in the calm setting of a congregation of sisters, on the edge of town. After the prayer, helped by texts from St Paul’s Epistle to the Romans, and from the Letter from China, we shared using the question: How can we sort out our desires? The small groups met in the garden before coming together for a meal, then for a celebration of light in the chapel. The Icon of Friendship, which has been circulating through all of Austria since the Zagreb meeting, was there as well. The book which accompanies the icon produced astonishment in discovering the stages of the icon’s travel across the whole country. And this journey continues. On the Sunday we were invited into Burgenland, near the frontier with Hungary. 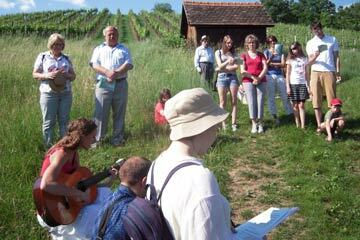 After taking part in a parish celebration, which used Taizé songs on this occasion, a group of thirty or so people set out on a pilgrimage across the vineyards towards a small chapel on top of a hill. This was an “everyday pilgrimage of trust”. We made four stops along the way, each time for a bible reflection, a time of silence, and a Taizé song. How marvellous to perceive the bursting beauty of God’s creation along the way! Thanksgiving for the Spring, emerging after long months of snow and cold, shone through the songs. Other meetings took place in Carinthia, and also with some young people from Slovenia who came for a bilingual bible sharing. The last evening at Salzburg had been prepared by the Catholic pastoral centre for youth, together with the student community. A discussion with the students before the prayer began, then the magnificent musical accompaniment for the prayer – in the town of Mozart! – were a unique moment for many. 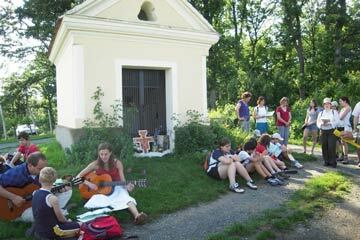 From all the Bundesländer areas, young people are setting out towards Taizé during the summer.